Now with added Kanji Notebook. 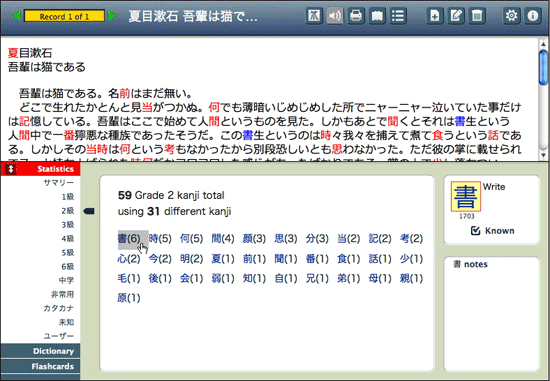 The kanji in the statistics panes can be clicked to get basic information about the kanji, its keyword and the KKLD index. there is also a checkbox to mark it as known. The example words are from vocabulary extracted from records in Kanji Sieve. Therefore all vocabulary should be relevant to your interests. 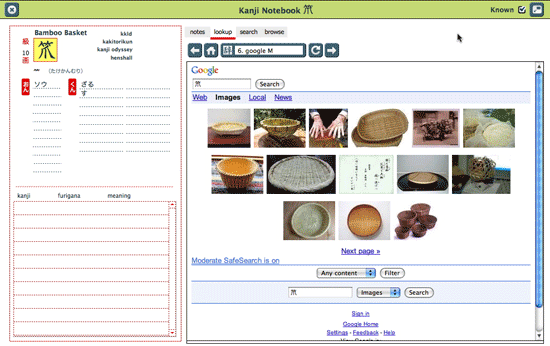 There is automated look-up of Internet dictionaries for a kanji. I find it interesting to search google images to see if I can guess a clear meaning or see how it is being used. You can explore kanji using the browse tab, to get lists by grade, radical, phonetic, kakitorikun screen, or Kanji Odyssey group. Kakitorikun is a great piece of software for the Nintendo DS. It’s main drawback is it’s completely in Japanese. 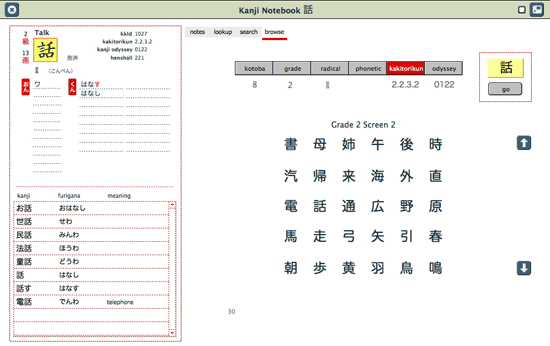 With Kanji Notebook I can at least easily put an English keyword to kanji on a given screen. Kanji Odyssey from Coscom is an excellent e-book based on the frequency of use of kanji. It has many examples and recordings of native speech. I recommend it. An added bonus is their completely free update program. Recently I got a new CD from them when they updated for the 2010 Jyouyou. Absolutely free, not even postage costs. That’s a rare service these days. There is the beginnings of language support for languages other than English. Spanish and French keywords are included. They will be displayed in preference to English when the preferred language is set in preferences. This also controls what language is used to query chuta.jp. However I found that the returns are very short so English is also submitted. wwwjdic will use the preferred language when searching for vocabulary. Complete translations of the interface are unlikely at the moment however. I am unable to insert a workable list of Kanji into the Custom List. Is there any special formatting needed? I`ve tried with Unicode, UTF8 and SJIS but to no avail. Kanji list appears pasted in window but when I press save everything canges to a single question mark. I’ve managed to reproduce it. It’s caused by paragraph returns in the text. As a workaround you’d need to strip these out in a text editor first. It seems because of the routine I’ve used to strip duplicates from the list it will only accept a string of characters. This would also happen in the known kanji pane and filter non-jyouyou pane as well. The character encoding is Unicode in the application. It should be easy enough to fix. I tried again using JWPce to strip line returns and spaces between the characters but still have same problem. Characters copy OK to Custom List window but are reflected as single ? when saved. I stripped line returns and spaces between characters with JWPce and exported UNICODE but still get same results. However, if I paste same exported text to Word 2010 and then re-export and paste to KanjiSieve everything works OK: Very strange. Any chance of having two (or more) Custom Lists? On the main screen the maximum number of Kanji used in the record shown is 50. How can I see the rest of the Kanji used (the other 73)? Are they shown on additional pages? It’s not character encoding as such. If it were just character encoding you’d get mojibake not an error (“?”) I reckon it’s the different handling of EOL in JWPce and Word. I would think Word handles it better. unlikely. It’s not that it can’t be done, but it’s going away from what I want to do, which is track the 1006 Kyouiku kanji, and my belief that it’s best to approach learning kanji within the grade 1 to 6 framework. I’ll have a think about an implementation though. On the stats screens you can only see the mos frequent 50 kanji per screen. It’s really only an issue with the unknown kanji screen, when there are many unknown kanji, and then the piece of writing is probably well beyond someones capability. You get full listings on a printout.